Clark Terry wasn't just a trumpeter with flawless technique; he was also, according to one peer, a "natural-born educator" who devoted much of his later career to passing on his immense musical knowledge. 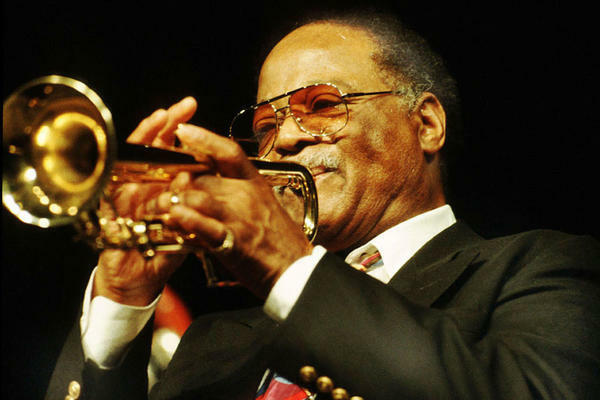 Jazz trumpeter Clark Terry has died. The musician's ebullient personality reached a nationwide audience as a member of NBC's Tonight Show band, and the sound of his expressive trumpet inspired younger musicians for nearly eight decades. The 94-year-old musician died Saturday. Clark Terry said he heard the sound of jazz everywhere as a kid in St. Louis in the 1930s: on the radio, in parades and wafting in from river boats floating along the Mississippi River. He came up with his own sound in a junkyard with a homemade trumpet. In 1995, he described it on the NPR program Billy Taylor's Jazz at the Kennedy Center. "I made it from an old discarded garden hose — I had it bound up like a trumpet, with an old piece of kerosene funnel, made it look like a bell," he said, laughing. "Then I put a piece of old lead pipe on the end, that was my mouthpiece. I couldn't make any music with it but I sure made a lot of noise with it!" He said when his neighbors couldn't stand the racket any longer, they pitched in and bought him a real trumpet. Eventually, Clark Terry learned to play jazz on the bandstand. In 1948, after a stint in the U.S. Navy, Terry hit the big time with the Count Basie Orchestra. Terry said the music education that started under the watchful eyes of older musicians back in St. Louis continued with Basie. "His most important thing he gave to all of us was the utilization of space and time," Terry said. "He became famous not so much for the notes he played as for the notes he didn't." After three years with Basie, Terry found himself playing with the bandleader who inspired him to make that childhood junkyard trumpet: Duke Ellington. Terry spent the late 1940s and most of the '50s crisscrossing the country with Basie and Ellington. But when they went through the South there was another passenger traveling with them: Jim Crow. Trumpeter Jimmy Owens is a generation younger than his friend and mentor Clark Terry, but he says he's heard Terry's stories. "When we see someone like Clark Terry and is so happy, so elated at what he is performing, not knowing what he went through, it's just amazing," Owens says. Clark Terry broke through a color line in the music business in the early 1960s. When the National Urban League lobbied the NBC network to hire black musicians for its orchestra, the white players in the Tonight Show band recommended Clark Terry. His occasional spotlight in front of a nationwide audience included his character Mumbles, a recording studio gag that was his sendup of some of the blues vocalists he played with back in St. Louis. Behind the humor was a jazz musician admired by his peers for his flawless technique, his crystal clear tone and musical ideas that reached all the way back to the jazz he heard as a kid. He devoted the last part of his career to sharing his immense knowledge through jazz education in colleges and universities. Trumpeter Jimmy Owens says jazz has lost a direct link to its earliest history — and a "natural-born educator." "He knew how to answer that question to not only give the answer to that question but give you further information about a situation," Owens says. With Clark Terry's passing, the living history he shared through his playing and his teaching is now just history. As a young trumpet player, the first name I learned after Louie Armstrong was Clark Terry. Terry thrilled audiences, playing for the Count Basie and Duke Ellington bands, as well as "The Tonight Show" band. He was just as good in small ensembles, as well. Clark Terry died yesterday. He was 94. NPR's Felix Contreras has this appreciation. FELIX CONTRERAS, BYLINE: Clark Terry said he heard the sound of jazz everywhere as a kid in St. Louis in the 1930s - on the radio, in parades and wafting in from river boats floating along the Mississippi River. He came up with his own sound in a junkyard with a homemade trumpet. CLARK TERRY: I made it out of an old discarded garden hose. I had it bound up like a trumpet with pieces of an old kerosene funnel stuck in to make it look like a bell. CONTRERAS: That's Terry in 1995 on the NPR program Billy Taylor Live at the Kennedy Center. TERRY: Then I put an old piece of lead pipe on end. It was my mouthpiece. But I couldn't make any music out of it. I sure made a lot of noise with it. CONTRERAS: He said when his neighbors couldn't stand the racket any longer, they pitched in and bought him a real trumpet. Then Clark Terry learned play jazz on the bandstand. CONTRERAS: Terry said the music education that started under the watchful eyes of older musicians back in St. Louis continued with Basie. TERRY: His most important that he gave to all of us is utilization of space and time, you know. He became famous for - not so much for what he played as for the notes he didn't. CONTRERAS: After three years with Basie, Terry found himself playing with the orchestra leader who inspired him to make that childhood junkyard trumpet - Duke Ellington. CONTRERAS: Terry spent the late 1940s and most of the '50s crisscrossing the country with Basie, then Ellington. But when they went through the South, there was another passenger traveling them - Jim Crow. Trumpeter Jimmy Owens is a generation younger than his friend and mentor Clark Terry, but he says he's heard Terry's stories. JIMMY OWENS: When we see someone like Clark Terry that stands up there and is so happy, so elated at what he is performing and not knowing what he went through, it's just amazing. CONTRERAS: Clerk Terry broke through the color line in the music business in the early 1960s. When the National Urban League lobbied NBC-TV to hire blacks for its orchestra, the white players in "The Tonight Show" band recommended Clark Terry. His occasional spotlight in front of a nationwide audience included his character Mumbles, a recording studio gag that was his send-up of some of the blues vocalists he played with back in St. Louis. CONTRERAS: Behind the humor was a jazz musician admired by his peers for his flawless technique, his crystal clear tone and musical ideas that reached all the way back to jazz he heard as a kid. He devoted the last part of his career to sharing his immense knowledge through jazz education in colleges and universities. Trumpeter Jimmy Owen says jazz has lost a direct link to its earliest history through a natural-born educator. OWENS: When one would ask a question, he knew how to answer that question to not only give you the answer to the question, but to give you further education about a situation. CONTRERAS: With Clark Terry's passing, the living history he shared through his playing and his teaching is now just history. Felix Contreras, NPR News. Transcript provided by NPR, Copyright NPR.